The Launch Vehicle Module (LVM), for use with MATLAB®, builds upon both of Princeton Satellite System's core toolbox products for aircraft and spacecraft: ACT and SCT. 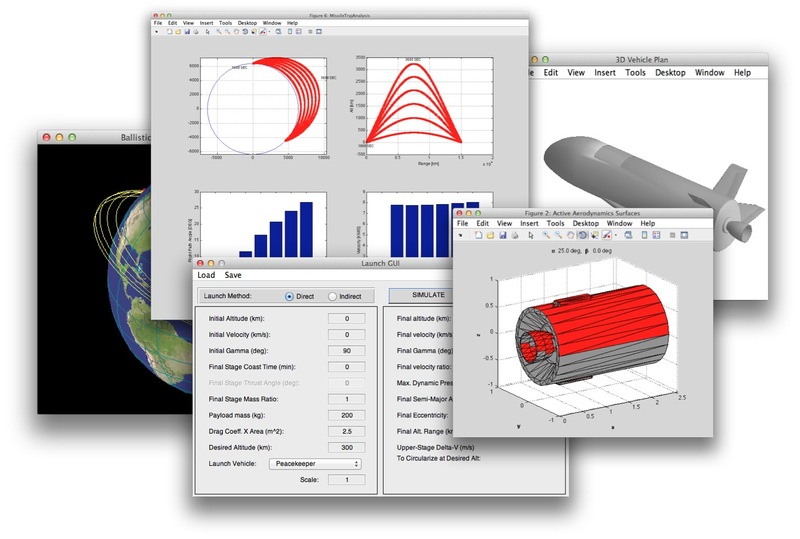 The LVM provides you with a wide range of tools for sizing launch vehicles, finding launch windows, modeling rocket dynamics and simulating launch trajectories from Earth up to orbit. We have used this package to design our two stage to orbit (TSTO) launch vehicle concept, the Space Rapid Transit (SRT). Launch vehicle sizing for early mission concept studies. Analysis of sub-orbital range and altitude capabilities. User-interactive GUI for developing direct and indirect launch trajectories. Newtonian aerodynamic model for hypersonic speeds. Please contact us for more information including the module API and an example demo. The Launch Vehicle Module is export controlled. All purchasers are required to supply proof of U.S. citizenship or Permanent Residency and proof that the software will be used in U.S. territory. Otherwise an export license will be required.